一般報告不包括郵筒照片 | "組織搜索隊 , 到可能地區 , 作徹底搜尋。" 一般報告不包括郵筒照片 – "組織搜索隊 , 到可能地區 , 作徹底搜尋。"
Ours was first created on 22/6/2009 and his was 30/6/2009, so probably we had inspired him. His work was good and original (all pictures different from ours) and he also maintained three other very interesting maps, a like-minded person I believe. Hey guys, I’ve added a lot of things to our 搜索隊 site today. 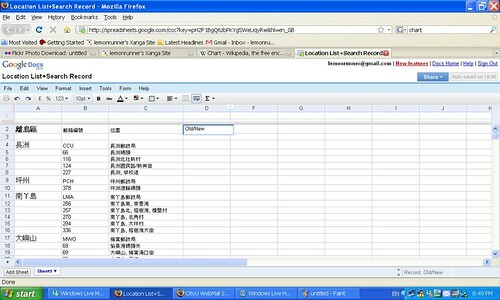 Fifth, I’ve added a short introduction of myself (in a hidden page accessible through the link next to my name in the page 隊員名單: http://hksearch.weebly.com/page2.html Have a look and if you like you can do the same for yourself. Have fun browsing and searching! I am deeply moved by the postbox photos that keep streaming in, and I would say there’s a lot of love in it – for the postboxes themselves, the place/society/world we are living in or visiting (and each other amongst ourselves). So I thought we should have a better site to record our findings (and show and share our love!). And now I have created a site on weebly.com, a free website hosting service. The URL is http://hksearch.weebly.com/ and do pay it a visit and bookmark it. I’m also new to it – juts heard about it yesterday and worked on it today for several hours to put this together. Basically what I did was I (re)organize the materials I’ve already put on our xanga site (http://hkpostbox.xanga.com/) in what I hope to be a more systematic way. Do give comments/suggestions and report back on dead hyperlinks. The site belongs to all members, so if you wish to post directly to it, contact me and I’ll give you the password. Also if you there are other items you want to search you may also want to get the other members involved and post the finding at this new site. I have myself floated the idea of searching HK old tai pai dongs 舊式大牌檔 and old buildings with a few members; interested anyone?. Also, if you like you can write a short paragraph about yourself or/and give a link to your personal blog for posting on the site. Collated the following list from what I found on various online forums. Let’s see when we can track them all down. Remember to take a picture when you see one of them and report back. Do report back even if you find it’s already been replaced by a new one, so we won’t unintentionally duplicate our effort. But of course repeat records are also welcome – I do that myself as I really love these postboxes -so do send them to me (or tag me to them on FB) for posting as team reports. P.S. Keep also searching the overseas ones ar. My belief is the more we search the more we’ll love them and probably also the world we’re living in. 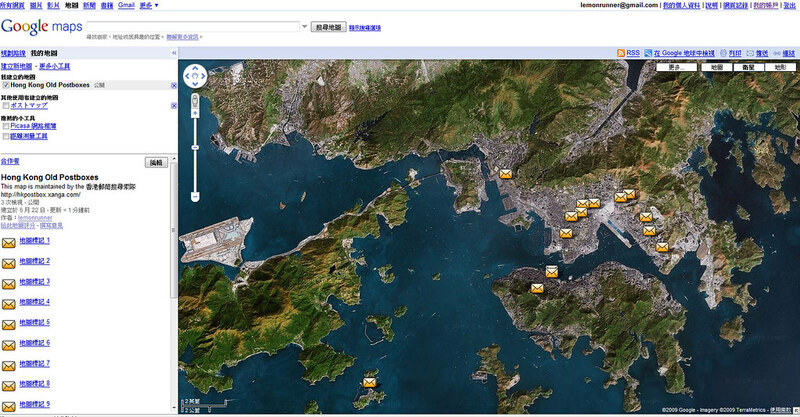 Just created this google map “香港舊郵筒地圖 Hong Kong Old Postboxes Map” (link); it’s not as sophisticated as the Japanese one but I thought I’d get it started anyway. 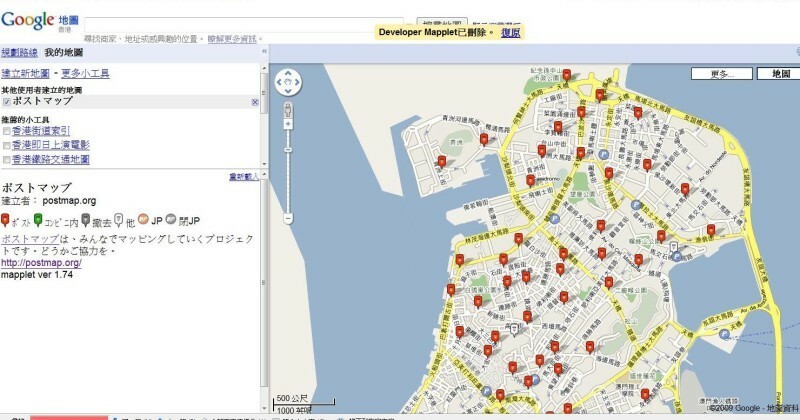 Totally in love with the Japanese search team and the Google Map gadget they created. The postbox symbols in this picture indicate the locations of postboxes in Macau. And if you click on it there’ll appear a small pop up box with info and photos of the postbox. Really briliiant! To view it: first install this Google Map Gadget ポストマップ, then go here (remeber to check the box on the left; if you don’t you won;t see the postbox symbols). Perhaps you’re also like this now, always looking out for postboxes when out on the street. Yesterday, for example, I walked from Yaumatei to Shumshuipo with an eye on the postboxes. It then occurred to me that it’ll be more efficient and, most importantly, more FUN if I have a location list in hand and track down the postboxes in one area one by one accordingly. It’ll be a great way to spend an afternoon, I guess! And when I was about to print the list from the Post Office’s site today, I figured some of you might also be interested and so I’ve now created an online spreadsheet (link here). Anyone can have access to it and can mark next to the postbox you’ve checked whether it’s an Old (with pre-1997 British crown) or New one (so that another member may just skip it in the next search). For example, if you’ve checked Postbox 100 and found it’s a new one, you just type New in the column next to its location. So this’ll be a truly collaborative effort and it is in this sense I’m saying we’re going Wiki. Sounds serious? No lah. Remember, this is first and foremost a fun project. So just search in whatever way you like – location list with a map in hand or happy-go-lucky chance encounter. Not a member yet: just do a search (even if no success in locating an old beauty) and report back and you’ll become one. 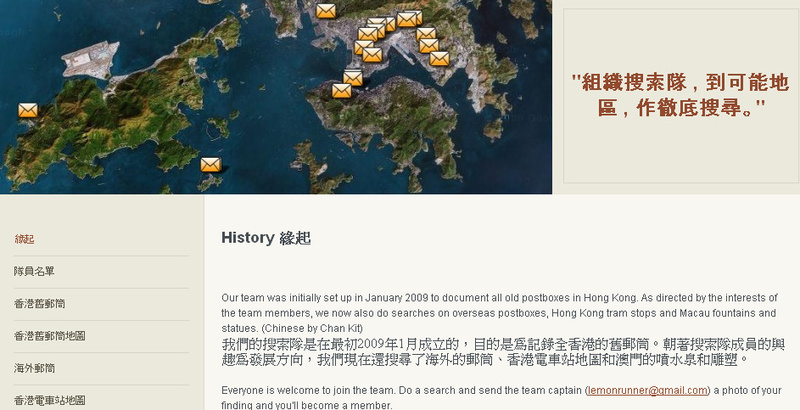 There’re more than 1000 postboxes in HK, so have fun!